It was not by accident that The Chronicle chose to spend part of New Year’s Eve with Huron Valley Ambulance. Recent labor negotiations between the city of Ann Arbor and the firefighters union have included discussion of how many responses firefighters make to various kinds of calls. The union has pointed out that their work includes considerably more than fire suppression calls. 10:20 a.m. Woman lying prone on sidewalk next to construction fence on east side of street after fall. Cyclist in full road racing kit tending to her. Fire department and Huron Valley Ambulance on scene a few minutes later. And finally, there’s been a recent change to the way fire dispatch is handled for the city of Ann Arbor. 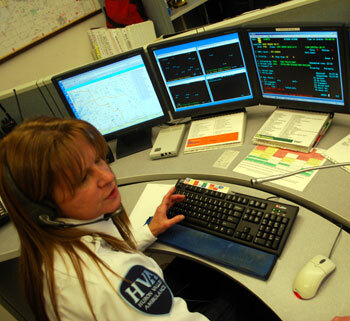 On Dec. 1, Huron Valley Ambulance began handling fire dispatch for the Ann Arbor fire department, working out of the HVA dispatch center on South State Street, just south of I-94. The contracts necessary to make that change possible were approved by the Ann Arbor city council at its June 15, 2009 meeting. 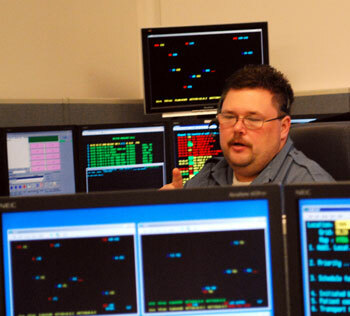 If HVA now handles fire dispatch, who handled it before? But more importantly, what does it mean to handle fire dispatch? Danny Blaszkiewicz turned back to the supervisor's desk to clarify some communication. Blaszkiewicz was providing support for ambulance dispatching. A fire dispatcher is someone who tells the fire department when, where, and what vehicles to roll down the road. Obviously, average citizens don’t make a call to the fire department – they call 911. Ann Arbor city council approved the roughly $50,000 expenditure for that remodel at its Dec. 7, 2009 meeting. The money will be reimbursed to the city from the 800 MHz public safety communications millage fund. Even before the change to HVA as the fire dispatching entity, HVA was involved in some decisions to send firetrucks to a scene. Here’s a quick sketch of how it previously worked. Key to understanding that sketch is the fact that oftentimes firetrucks are sent to a scene not based on an assessment that there’s a fire danger – they’re sent in order to increase the chances that some medical first-responder can arrive on the scene fast enough to make a difference. With six fire stations distributed throughout the city of Ann Arbor, putting firefighters in play for medical responses reduces the time it takes to put someone on the scene who can begin to administer aid. So reflecting on the Stopped.Watched. item about the woman who’d fallen on the sidewalk, the fire dispatcher didn’t send a firetruck because there was a fire that needed dousing. Rather, the medical facts of the call dictated that the fire department was dispatched to the scene. It’s possible that the medical facts of that pedestrian fall were unclear, which would be enough to send the fire department on the call. Per the “Falls” card, “Level B Unknown Status” dictates that a category 2 fire department like Ann Arbor’s would be sent to the scene. City of Ann Arbor firetrucks now roll when HVA tells them to. One efficiency that’s achieved is the elimination of a possible circularity – a call sent first from 911 to HVA, then back to 911 for fire dispatch. At the June 15, 2009 city council meeting, an additional benefit cited for HVA fire dispatch was a reduction in unnecessary responses made by the fire department to medical calls. As comparative data becomes available – before HVA handled fire dispatch, and now – The Chronicle will follow up with a look at what differences, if any, emerge. Heather Rossi took calls from Oakland County. The contrast between rolling the Ann Arbor fire department or not emerged on New Year’s Eve in the following way: The Ann Arbor fire department was dispatched to the Fuller Road area – for an unconscious patient who’d possibly overdosed. But Ann Arbor fire was not sent to the parking lot of the old Ann Arbor News building, where Ann Arbor police were already on the scene with a very cold patient who’d been drinking too much. Drinking-related incidents, not surprisingly, accounted for many of the 78 calls received by HVA in the first 3 hours and 43 minutes of 2010 – that was the limit of The Chronicle’s stamina. Two of those calls – one in Ann Arbor and the other in Ypsilanti – fit the following pattern: A group of younger-sounding people, walking from one place to another, discover a stranger lying in the snow, who had been drinking too much; they stay with the person until help arrives. 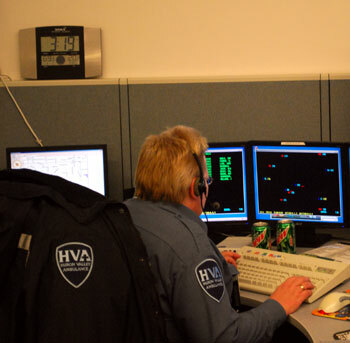 When a 911 call is transferred to HVA, it goes to the “call-taker.” On New Year’s Eve that was Terry Pappas for all calls except those from Oakland County. Oakland County call-taking was handled by Heather Rossi. 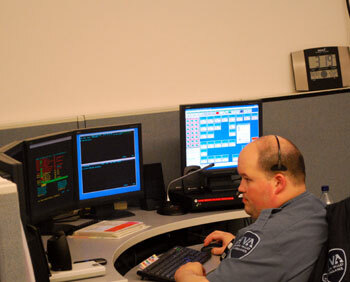 The call-taker uses the computer-aided dispatch (CAD) system to record information on location, the nature of the medical emergency and its priority. That information becomes simultaneously available to the rest of the team – handling a call is not a solo effort made by the call-taker. The communication to the ambulances and fire stations is handled by two additional people: the ambulance dispatcher and the fire dispatcher. Ambulance and fire dispatchers send vehicles rolling down the road based on the information that shows up on their screen, as keyed in by the call-taker. On New Year’s Eve, the guy who was contacting the fire department for HVA was Alexander Pahany – a former firefighter himself, who is also an attorney. And dispatching ambulances that night was T.J. Hubaker – she was being assisted in that role first by Erik Youngblood, who was then relieved by Danny Blaszkiewicz. There’s an inherent teamwork built into the division of labor among the call-taker, fire dispatcher, and ambulance dispatcher. They communicate through information exchanged on screen – ongoing notes are keyed in on the status of any particular run. But team members also don’t hesitate to just talk across the room. T.J. Hubaker dispatched ambulances on New Year's Eve. One of those occasions of across-the-room talking came when Pappas set up the CAD system to roll over to a new set of “run numbers” for the new year. At midnight, the index was to be reset to all zeros, but the system began assigning the new numbers 7 minutes early. Pappas called on her shiftmates to help track down the last run numbers before the premature switch, so that she could rectify the issue. And just before midnight, the numbers had been re-reset. Pappas and her shift have a chemistry that is readily apparent as they spell each other on breaks, and resolve the inevitable unclarities of communication. It was the 8th New Year’s Eve in a row Pappas had worked with Hubaker. For Pappas it was her 13th New Year’s Eve shift for HVA. 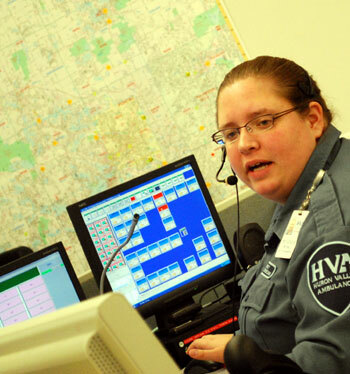 In addition to the two call-takers and three dispatchers, also on duty on New Year’s Eve was the HVA 211 call-taker, Chrissy Wirts. The 211 line is for human services referrals. It’s not just the medical calls that HVA dispatches for the city of Ann Arbor fire department (along with almost a dozen other area fire departments). When there’s a structure fire, it’s now HVA that dispatches Ann Arbor’s firetrucks to the scene. Alexander Pahany was on fire dispatch duty. 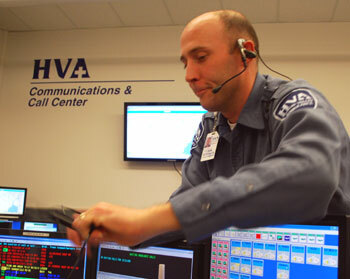 HVA’s fire dispatcher on New Year’s Eve, Alexander Pahany, is a former firefighter, as is Pappas. And Danny Blaszkiewicz, who was Hubaker’s “wingman” on ambulance dispatch, is currently a firefighter. But fire dispatch does not depend on the gut instinct of dispatchers who are cross-trained as firefighters. 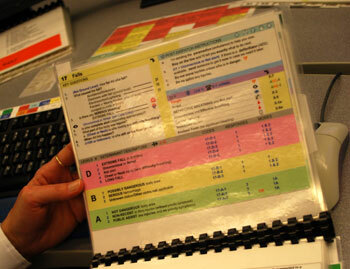 Similar to the EMD protocol card book for medical emergencies, there’s a card book for structure fires as well. The CAD system is also programmed with several thousand different “cards” that were built to handle all the various scenarios for kinds of fires, their priorities, and the specific vehicles available at each of the six stations in Ann Arbor. Call center training at HVA takes 1-2 years. And that comes on top of paramedic training, which itself can take 1-2 years. All of the necessary training courses can be completed through HVA. HVA also offers a free HVA Citizens Academy. The next 8-week program will be held on Wednesdays from 6-9 p.m. starting Feb. 3, 2010 through March 24, 2010. Registration information is available from Jason Trojan, HVA Community Relations Coordinator: jtrojan[at]hva.org. Erik Youngblood handled some cabling issues. He was providing support for ambulance dispatch until Blaszkiewicz could arrive.